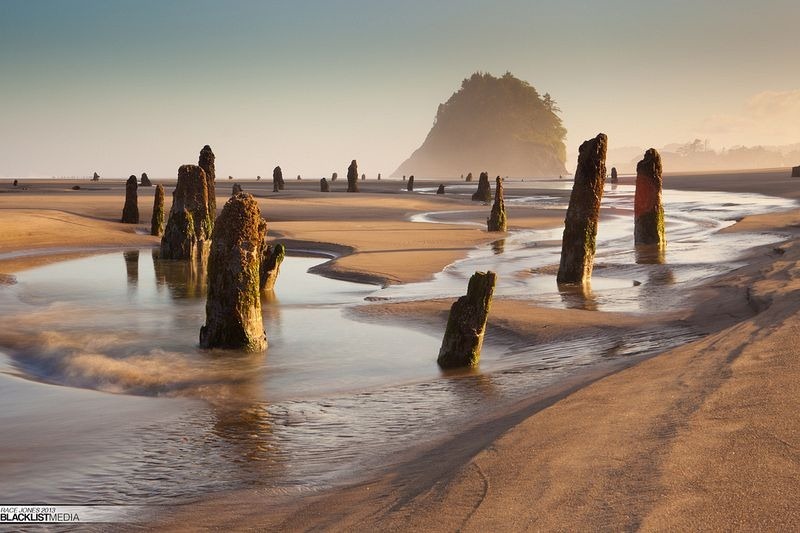 In the small coastal town of Neskowin in Tillamook County, Oregon, United States, somewhere between Lincoln City and Pacific City, are the remains of an ancient Sitka spruce forest. 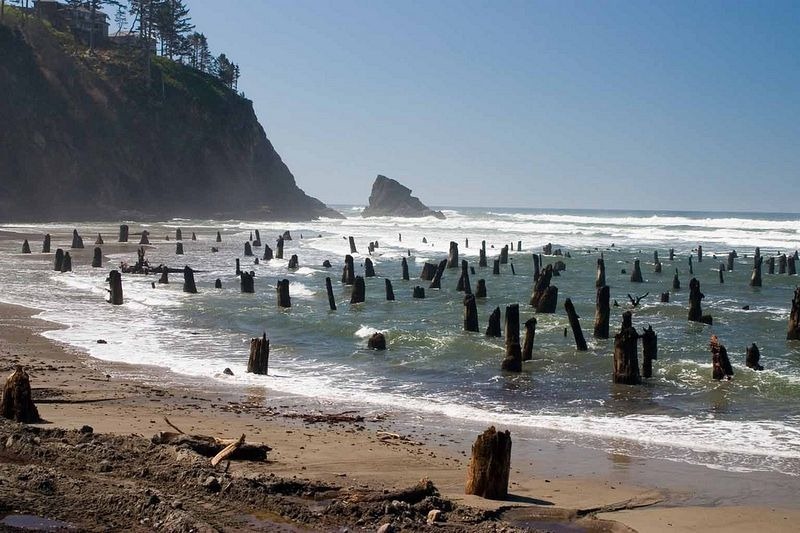 For nearly 300 years, the stumps of the “ghost forest” had been hiding under the sand until they were unearthed in the winter of 1997-98, when a fierce storm lashed the Oregon Coast. The storm had eroded away a part of the beach revealing about one hundred barnacle-encrusted tree stumps. 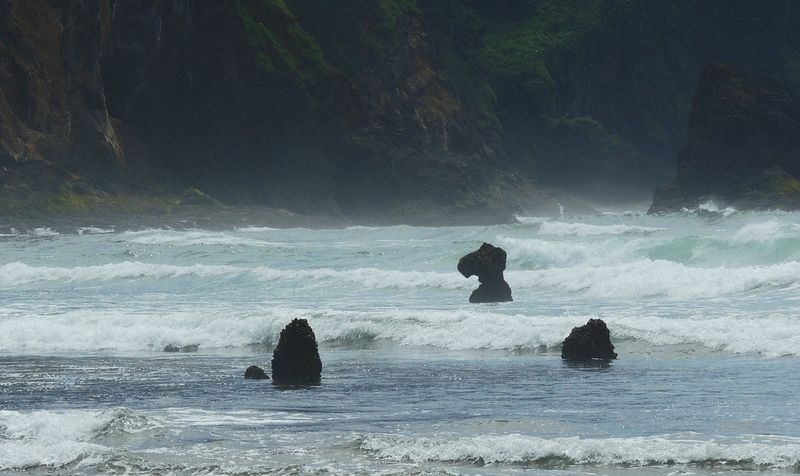 Before the big uncovering that winter, the stumps were a mere local legend, with longtime Tillamook County residents saying they only emerged once every several decades, and only briefly. 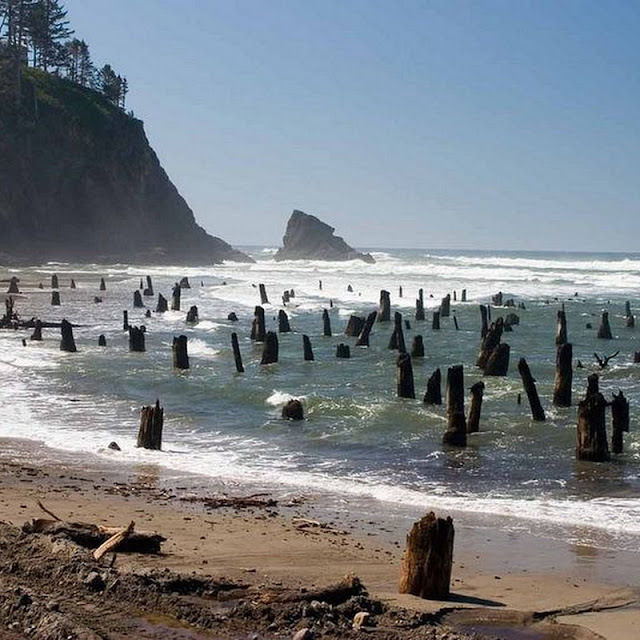 Since the winter of 1998, the Neskowin Ghost Forest has become a permanent fixture on the beach. The stumps of the ghost forest are estimated to be approximately 2000 years old, and when they were alive, the trees are thought to have stood 150-200 feet tall. Carbon dating of the tree stumps revealed that the forest had died between the years 1680 and 1720. Researchers reasoned that a massive earthquake in the Northwest could have killed the ghost trees, and the subsequent tsunami generated by the quake could have enveloped the trees in sand. Referring to old Japanese manuscripts, researchers found that only one tsunami had occurred between 1680 and 1720, which had flooded several Japanese villages. The date was quickly figured out — January 26, 1700. The year matched when researchers found by studying the tree rings on the stumps that the ghost forest trees were alive and healthy in late 1699, but dead by spring of 1700. 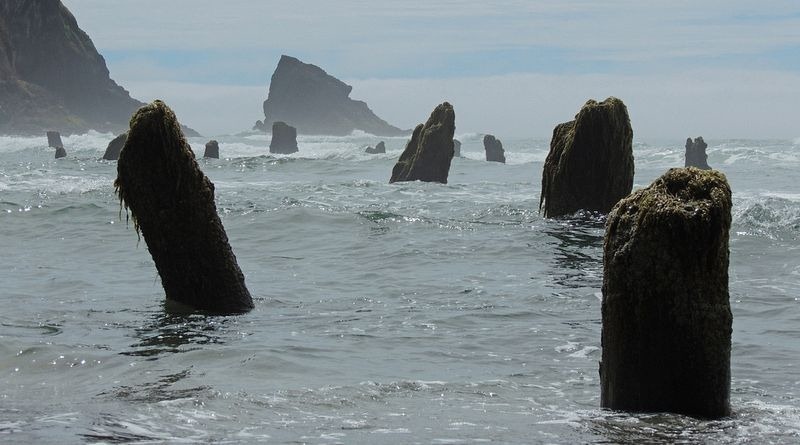 It’s now believed that a massive earthquake had struck the coast of Oregon in the year 1700 dropping this chunk of land abruptly by as much as thirty feet. Tidewater had rushed in, drowning the trees in mud. Shortly after an enormous wall of water had slammed against the trees decapitating them near their bases. Over time, accumulated tidal mud and sand had swallowed the tree stumps and kept them away from the decaying effects of oxygen and bacteria, until their uncovering in the winter of 1998.